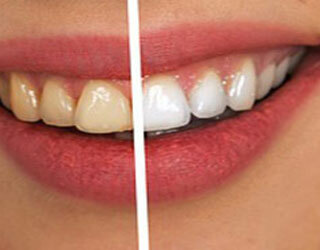 Professional teeth whitening helps patients achieve a brighter, whiter smile. Whitening removes stains or discolorations that can be caused by aging, using tobacco, and consuming certain beverages like coffee, tea, and wine. It is great for patients who want to erase color imperfections and achieve maximum whiteness. Whitening utilizes hydrogen peroxide, a natural oxidizing agent. Different concentrations of hydrogen peroxide are available depending on a patient’s sensitivity and long-term goals. Whitening “strips” utilize high concentrations of peroxide for quick results, but the trays do not have an intimate fit to the teeth and are more likely to cause sensitivity. On the other hand, custom fit trays are trays that are made to fit your teeth specifically. They reduce the amount of peroxide that is needed, reduce the concentration, and reduce the sensitivity. Custom trays are best for patients who want long-term results. Bay Hills Family Dentistry is happy to offer customized whitening services – call us today to schedule your appointment.